This wine is so unique in the range of wines produced in Marche that it could be considered a true rarity. It is obtained from the Sauvignon Blanc grape that is exposed to Botrytis Cinerea mould and comes from the Moie Maiolati vineyard, which is owned by a company particularly well qualified for this type of work. The grapes are allowed to over-rippen on the vines and develop a natural mould. They are collected by hand in wooden trays as and when they are sufficently ripe and have the correct amount of mould. They are gently crushed using a small Vaslin press and spontaneous fermentation takes place under a controlled temperature of fifteen degrees centigrade for about a month. After the dregs have been removed the winer is aged in very small satinless steel containers and then bottled. 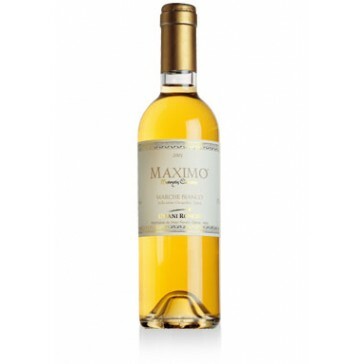 The wine is an amber yellow with a golden reflection and has a very characteristic aroma that is strong, long-lasting with a note of ripe figs and a delicate hint of ripe apples. It tastes rich, sweet and well-balanced with a note of alcohol. It is mellow and young. This wine is excellent with cakes, but is also a wine that can be drunk on its own. It is also very good with spicey cheeses. Serve at 10 - 11 degrees centigrade in clear, transparent crystal goblets. If kept well, this wine has an average conservation period of eight to ten years. The bottles should be laid horizontally in a cool, dark, humid wine-cellar. An article about the market of Barbera, quotes Wineshop.it among the online wine shops that sell this wine.